Journey for nature and flower lovers through the forested foothills of the Khan Khentii Wilderness. 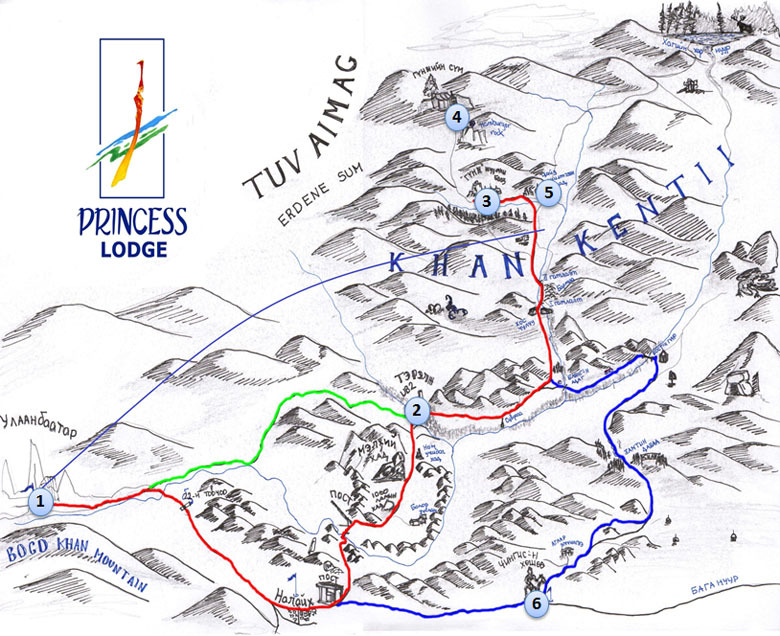 This Mongolia tour starting from Ulaanbaatar and arrive in the Princess Lodge which lies only about 98 km. On our Mongolia trip we will be driving through the Gorkhi Terelj National Park. As we trekking through this picturesque scenery it is hard to believe we are so close to Mongolia’s largest city. This morning we depart the capital and head east, along the road to Terelj, the only real settlement located inside the Gorkhi-Terelj National Park (65 km). From Terelj the paved road ends, and we head further into the depths of the park, heading up along a dirt track on the bank of the Terelj River, Approximately 29 km after leaving Terelj the track deteriorates and here we will overnight Princess Lodge. Relax in national GER in the beautiful Khan Khentii Mountain and short flower discovering trip near the Princess Lodge. Today we will take a full day observing flowers and visit the ruins of the Gunjin Temple (Princess Temple), which is nestled within the Khentii Mountains. This Monastery has many fascinating tales of love and loss of war and peace surrounding it. The inside of the Monastery was largely destroyed during the communist years, leaving only the outer structure intact, but the stories are still told keeping the spirit of this beautiful place alive. Field lunch. This area is like a flower carpet changing color every 10 days. Crossing little river and relaxing beautiful landscape scenery different direction. Return to base camp in the evening. After having nice tasty breakfast prepared by the camp chef trekking to white Stupa and continue flower discovery in fantastic rock formation near bank of Baruun Bayan river. Arrival at dinner. After breakfast drive to nomadic family and learn their life style, creation new mind of nomads and also will be introduced how they producing dairy products, which is loved by Mongolians. Mongolian food is seasonal in the summer months, when animals can provide milk, dairy products become the staple food. Way back to UB visit Chinggis Khaan’s statue in Tsonjin boldog or we will directly drive to UB passing by Terelj.